If your mattress doesn’t feel as amazing as it used to, and you keep tossing and turning at night in hopes of finding that one spot that still feels comfortable enough for you to get some sleep, you came to the right place! Believe it or not, a topper can make a huge difference in how your mattress feels. Plus, it’s the most affordable way to make an old mattress feel brand new again. That’s why today I’m going to help you find the best mattress topper available in 2019! Do Mattress Toppers Come With Any Disadvantages? If you’re not entirely sold on the idea of buying a mattress topper, and can’t help but wonder if it’s a real necessity, you should check out these four significant benefits of owning a mattress topper – even when you don’t think you need one. Let’s start with the most obvious one – you’d be surprised how big of a difference a few inches of memory foam or a soft filling can make! If your mattress falls short in comfort or softness, a topper could help balance things out. Seriously, it’s one of the cheapest ways to give an old mattress a brand new feeling! If you own a memory foam mattress, then you probably know how big of an issue body heat retention can be. Nowadays, mattress toppers are made with improved breathability and heat dissipation in mind, though. So, if you’re getting tired of waking up in a pool of sweat every night, a topper might be the answer to keeping your cool. We spend a third of our life sleeping, which means our mattresses have to put up with a lot, and as you can imagine, that will take a toll on even the best of them. A topper could reduce that daily wear and tear significantly, and prolong its life for a couple of years. Plus, if you opt for a moisture-resistant and hypoallergenic mattress topper, you can shield yourself from potential allergens hiding in your mattress, as well. While it’s true that a high-quality mattress could last for up to 10, even 15 years, they also tend to cost well over a thousand bucks – and not everyone can afford to spend that kind of money. That’s where mattress toppers come to play. You can get all the benefits of a new mattress, but for only a fraction of the price. Even if you end up buying a new topper every few years, it will still be a cheaper solution and a worthwhile investment. Sure, your sheets might fit your mattress perfectly now, but once you add a few extra inches on top, that’s going to change, which means you’ll probably have to do some sheets shopping along with your new mattress topper. Since it’s not an integrated part of your mattress, but an add-on, instead, there’s a strong possibility you won’t find your topper where you left it the previous night. Some sliding is normal, though, especially if you’re a restless sleeper. That’s mostly true for memory foam toppers, although some latex models tend to retain some heat, too. If you’re a „hot sleeper,“ you should check if the model you’re interested in has a problem with regulating your body temperature. One thing I’ve noticed is that there’s a lot of confusion regarding mattress toppers, and their close relatives – pads, protectors, and encasements. The answer is no; they’re not. Much like different types of mattresses, they might be similar to some extent, but the role each of them plays in providing you with a good night’s rest is entirely different. So, to put an end to this confusion once and for all, I’ve decided to dedicate this next section to explaining the differences (as well as pointing out the similarities) between mattress toppers, mattress pads, mattress protectors, and mattress encasements. The purpose of a mattress topper is to either make your mattress softer or a bit more firm – the focus is on providing an extra layer of comfort. That’s why they’re generally thicker than mattress pads. 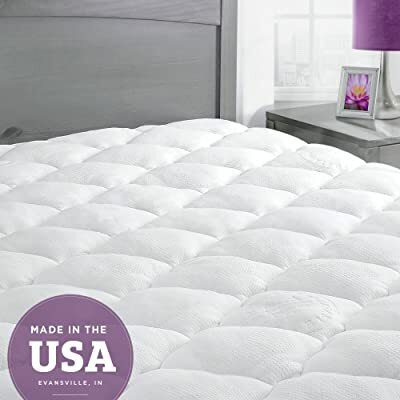 Best for: If you tried mattress pads in the past, and weren’t impressed with the results, toppers might change your mind – they’re pretty much the new and improved version of mattress pads. Give it a second look, and see for yourself. These tend to add some comfort to your mattress, although not nearly as much as mattress toppers. That’s because they’re significantly thinner than toppers. They do have their benefits, though, and one of them is body temperature regulation. Best for: If you’re working with a tight budget, and you’re not set on changing your mattress’s firmness level, but still want the benefits such as temperature regulation or something that will keep your sheets in place, pads are the way to go. The name pretty much says it all, don’t you think? These “protective“ features can be found on pads and toppers, too, or you can add them by buying a mattress protector, instead. Best for: If you’re looking for a way to keep your allergies under control, or want to add an extra layer of protection to your mattress, mattress protectors are the solution to your problem. Parents of kids that struggle with bed wetting could benefit from buying one, as well. Encasements are something different entirely – they’re not about comfort; they’re all about protection from bed bugs. There’s a reason why they’re often found in hotel rooms, you know? Best for: If you’re trying to fight off a bed bug infestation, think of mattress encasements as your new best friends! Before we move to the actual mattress topper reviews, here’s a quick sum up of all the vital features you should keep in mind before you purchase a mattress. Plus, it gives you a chance to see how all these different models compare to one another! 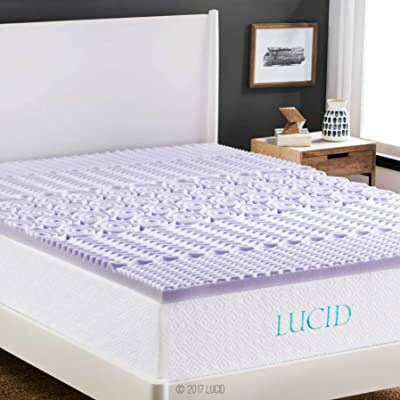 Okay, let’s start this round-up with one of my personal favorites – a mattress topper by LUCID. Featuring five body zones – differently textured areas for different parts of your body – the topper is excellent at eliminating pressure points and providing a comfortable overall sleeping experience. That’s not the only thing this textured surface is excellent for, though – it also ensures some additional airflow, which will somewhat improve the topper’s breathability. Also, I love the added touch of lavender! It had such a relaxing effect on me. If you like the idea of feeling like you’re sleeping in the middle of a field of lavender, this one’s perfect for the job. I wish the smell lasted a bit longer, though – it airs out after a couple of weeks. It may not seem like a big deal, but you’d be surprised how fast you can get used to falling asleep surrounded by the soothing smell of lavender. Another thing I’d like to mention is that the topper does get a bit hot, especially if you live in a warmer climate. Keep that in mind before you make the purchase. I still can’t get over how beautiful that lavender smell was. I can’t remember the last time I fell asleep feeling so relaxed. I even decided to get a diffuser and some lavender oil, so I could recreate the calming atmosphere once the scent from the topper was gone. Laugh all you want, but you’ll get hooked, too! Next, I’d like to talk about a memory foam topper by Linenspa. It has a standard thickness of two inches, and it’s made of memory foam, but with a twist – the foam is gel-infused and forms an interesting swirl-like pattern. What can I say, it looks pretty! But more importantly, the topper conforms to your body, which helps to keep your spine aligned, and relieve pressure on all your major joints. That’s one of the main reasons why I tend to recommend this topper to back and side sleepers. If you’re reading this, and you tend to sleep on your stomach, don’t worry – you could still give it a try, but know it does sink in a bit. However, the topper traps heat pretty quickly, so if you tend to “sleep hot“, this probably isn’t the best choice for you. Furthermore, I have a feeling that durability might be an issue, as well. I might be wrong, but it just seems like it won’t be able to withstand the daily wear and tear very long, especially with all the adjusting you’ll have to do because it moves around so much. I’ll admit it – I’m a sucker for unusual patterns. It’s no wonder I liked this gel-infused memory foam topper straight away. I mean, look at all those swirls! Plus, it’s super comfy to sleep on – it strikes the perfect balance between support and conforming, which makes it an excellent choice for side and back sleepers. Stomach sleepers might enjoy it, too, but that pretty much depends on personal preferences. 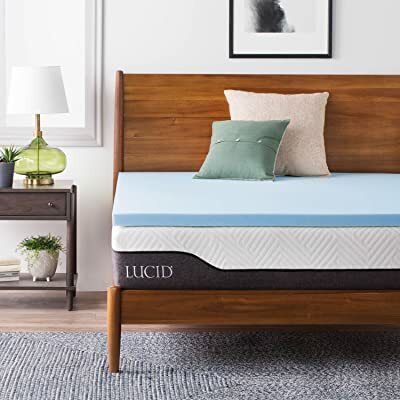 If you’re looking for an affordable way to breathe new life into your old mattress, look no further – this LUCID gel-infused memory foam topper might be the perfect solution for your problem. One of its most talked-about features is its ventilated design – hundreds of evenly distributed holes will allow for more breathability, and with so much air moving through the topper, there’s no way you’ll ever get hot. On top of that, these tiny holes help distribute your body weight better, making this one of the best mattress toppers for side sleepers. Also, I am forever grateful to LUCID for making a memory foam topper that doesn’t have that annoying chemical smell. However, if you’re a restless sleeper, good luck getting it to stay in place. Tossing and turning will make this thing slide all over the place. Tearing is a much bigger issue, though. I didn’t think of it before, but it seems these ventilation holes are the perfect location for small tears to form. I’m just scared about them growing with time and ruining the topper altogether. I’m not what you would call a „hot sleeper,“ but I’ve had my fair share of waking up sweaty, so I know how annoying that can be. If you’re in the same boat, and sleeping makes you sweat almost as much as going to the gym, I know you’ll appreciate this LUCID topper with its ventilation-oriented design. Finally, you can say goodbye to night sweats! Okay, I admit it, I fell in love with the interesting blue swirls again. However, I’m still not entirely sure if that’s gel or just blue-colored foam. As long as it doesn’t overheat – which it doesn’t – who cares if it’s gel or not, right? Of course, looks aren’t the only thing that matters. What made me save a spot on my list for this particular model was all the additional comfort and plushness it brings to the table – or the bed, to be exact. Thanks to the visco-elastic memory foam, the topper could help relieve some of your pressure points, resulting in overall improved sleep quality. Whether you’re a side, back, or a stomach sleeper, I’m pretty sure you’re in for some restful nights with this one. It costs a bit more than some other models on the list, though, so keep that in mind if you’re working with a tight budget. Also, be ready for a strong chemical smell to fill the room – open every window in sight, and leave it be. It should get better after a couple of hours. When I first got this mattress topper, I was skeptical. After all, I have trouble sleeping, no matter what. But this topper was so comfortable that it made it difficult for me to get out of bed because I loved sleeping on it so much. For the price, it is an insane deal, and you should jump on it while it lasts if you need a cooling experience or if you need a softer sleeping surface. I had no problems with aches and pains in the morning or overheating. It helped relieve my back pain. This topper offers a blissful, dreamy mattress topper experience! If you noticed your mattress isn’t as comfortable as it used to be, but you can’t afford to spend a small fortune on a new one, a budget-friendly topper might be your best bet. And yes, I have something in mind for you – a model by Zinus. Sure, with a 1.5-inch profile, it’s pretty thin, but it’s also super cheap, so you could use it as a band-aid solution until you can afford to buy a new mattress. The memory foam is infused with both Castor oil and green tea extract, and on top of that, it contains active charcoal, as well. That should be enough to keep your topper fresh and moisture-free. Guess what’s the first thing I noticed once I opened the box? That’s right, the chemical smell. I feel like a broken record repeating this, but it’s something to be expected from memory foam toppers. Just leave it to air out – that should do the job. The more significant issue is how quickly this thing tears. It might be a quality issue, but I’m pretty sure it’s more about thickness than anything else. It is, by all means, a great memory foam mattress, but another inch of thickness wouldn’t hurt. The one major issue I had with this topper could easily be explained by how thin it is. One and a half inches is not a lot, as you can imagine. That said, it’s a great backup plan if you’re currently not able to afford a new mattress. The next one on my list is a model by Advanced Sleep Solutions – a breathable, two inches thick topper every side sleeper will love. Since it was yet another memory foam topper, I did expect it to get hot – but I forgot about the gel. Thanks to the open-cell design and the gel-infused memory foam combo, there wasn’t any overheating, which makes it the perfect choice for the so-called “hot sleepers”. Another massive plus for the Advanced Sleep Solutions is the fact that their mattress toppers don’t come with that awful, chemical smell – you won’t have to run out for a breath of fresh air as soon as you open the box. One thing I’ve discovered is that the topper doesn’t work for stomach sleepers. It’s not able to keep your spine aligned, which can only end with you waking up with back pain. So, if you find yourself dozing off in that particular position more often than not, keep on looking. Also, it’s a bit pricey – not flat out expensive, but pricey enough to not fit everyone’s budget. But it’s well worth the money you spend on it. Another excellent choice for the so-called „hot sleepers,“ the Advanced Sleep Solutions mattress topper, really does live up to its name. Thanks to the gel-infused memory foam, open-cell design, and improved breathability, it’s more than capable of keeping you fresh throughout the night. And in my book, that counts as an advanced sleep solution, you know? First off, all that fluffiness will surely give any mattress, no matter how firm, a softer feel. Then there’s the silky texture of the bamboo blend fabric – you’ll love how beautiful it feels to the touch. To top it all of, it’s incredibly breathable, which means temperature regulation won’t be an issue anymore. You can say goodbye to waking up in pools of sweat! Together, these features will provide one of the most comfortable sleeping experiences you’ll ever have. And no, that’s not an overstatement – I’d go as far as to say that this topper feels like sleeping on a cloud. Sadly, the topper isn’t machine-washable. Even though the instructions explicitly say you can wash it the washing machine, I wouldn’t suggest doing so, because you risk finding it in pieces. Don’t say I didn’t warn you! Another issue I’ve had – but it’s a minor one – is that it tends to bunch up (especially the skirt) as you move around throughout the night. It feels like sleeping on a cloud. I’m serious – the material invites you to take a nap. Plus, you won’t wake up drenched in sweat, because it’s incredibly breathable. The only real downside here is the fact that you might not want to leave your bed in the morning. Okay, I think it’s time to kick things up a notch and introduce something entirely different – a dual-layer mattress topper. So, Sleep Innovations came up with a brilliant idea – unlike other models, their topper features a two-piece design. First, there’s the fiberfill comfort layer, which looks a bit like a giant pillow – check it out for yourself, you’ll see what I’m talking about – followed by a two-inch thick layer of gel memory foam. You pretty much get the best of both worlds, so it’s no wonder this is one of my favorites when it comes to relieving pressure points and getting a good night’s rest. It’s the fact that you can use the two layers separately that gives this one massive advantage over the competition, though. Seeing (experiencing, to be exact) how hot it gets during the night was a bit of a disappointment, though. Don’t let the blue foam layer fool you – there’s nothing cooling about it! Another thing you should know is that it will smell. I mean, it’s not that big of a deal – you would expect a new car to smell a certain way, too – but it’s worth mentioning, nonetheless. If the previous model felt like sleeping on a cloud, then this one feels like sleeping on a giant pillow. And even if you don’t have a memory foam mattress, thanks to the bottom layer (that’s the blue one, to be clear) you can still get the memory foam experience. The best thing is that this Sleep Innovations mattress topper comes in two separate layers, giving you the opportunity to experiment and find out what works for you. Continuing down the path of different topper designs you can try, the next one on my round-up of the best mattress toppers is a model by Superior. What makes it stand out of the bunch? Well, it’s not a memory foam topper, unlike the majority of products on this list, and on the market, in general. Instead, Superior offers an “alternative“ approach to comfort – a microfiber shell paired with a down alternative polyfill. If you’re allergic to goose down – and anything feather-related, for that matter – I strongly suggest getting yourself one of these. The fact that it can be machine washed is a huge plus, too. You can say goodbye to spot cleaning and give your topper a thorough wash whenever the need arises. The only issue I’ve had with this particular model was that I couldn’t find a way to keep it in place. Seriously, this thing slides all over the place! Up and down, side to side – you get the picture. The only place it doesn’t seem to like is the center of the mattress, where it should be in the first place. Allergies are annoying as it is, but when they find their way into our bedrooms, they become nearly unbearable. That’s why I was so excited to talk to you about this Superior mattress topper – if you’re allergic to anything feather-related, but you’re not big on memory foam, either, you’ll love the alternative down polyfill! Good luck with keeping it in place, though. If you and your partner can’t seem to get a good night’s rest no matter what you do, I have great news for you – the Best Price Mattress topper is ideal for couples looking to improve their sleep quality! To cut things short, this model is all about movement isolation. Boasting four inches of memory foam, not only the topper offers support and cushioning, but ensures uninterrupted sleep for both you, and your partner – no matter how much you toss and turn. On top of that, it’s excellent for back sleepers and those who have scoliosis, upper back pain, herniated discs, or recent back surgery because of its body-conforming properties. It did have that chemical smell, but many other memory foam toppers do. I won’t hold it against this model. Plus, it went away pretty fast. The more significant issue is the firmness. Sure, the movement isolation feature is a great thing, but at the same time, I was under the impression that it made the topper slightly bit more firm than it needs to be. Did I save the best for last? Keep on reading to find out! If you’ve been suffering from back-related problems for quite some time now, don’t even think about it, and get this one. Your back will be eternally grateful for it, I promise. I know this, because I had the opportunity to try it out – even with my bad back, sleeping on it felt like heaven. The first thing you should check is the material. Not only does it play a huge role in the overall experience the topper provides, but it determines how the topper will “agree with you“ regarding allergies, and stuff like that, as well. That’s, by far, the most popular choice on the market – and for a good reason, too. By conforming to your body, it provides plenty of support, which makes it the ideal choice for those suffering from back pain. However, you should prepare yourself for the strong chemical smell, as well as some heat retention – memory foam is known for its tendency to get hot. If one of the main reasons why you’re getting a mattress topper is allergies, wool is something you should consider. Wool toppers are resistant to the common bedroom allergens, plus they’re excellent at providing all the warmth you might need during winter, while still keeping you cool during hot summer months. They’re super expensive, though. 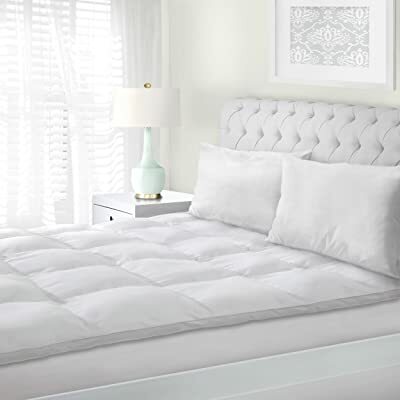 If all you want is to add an extra layer of softness, or a touch of luxury to your bed, and don’t care about the additional support that much, feathers and other soft down options are your best bet. If you’re looking for something durable, supportive, with not a lot of maintenance, latex is your guy. You should know up front that it’s going to be expensive, though. Lastly, you can always opt for a cotton or polyester topper (although they do tend to come as a mix of both, as well) – whichever feels better to you. One huge benefit is that they’re easy to clean, unlike some other materials on this list. However, they do come with a downside – they’re not very durable. What do you hope to gain from buying a mattress topper? Now that you know about all the available materials, you’re probably wondering how do they all compare to the most popular one – memory foam. This quick sum-up should clear things up a bit. 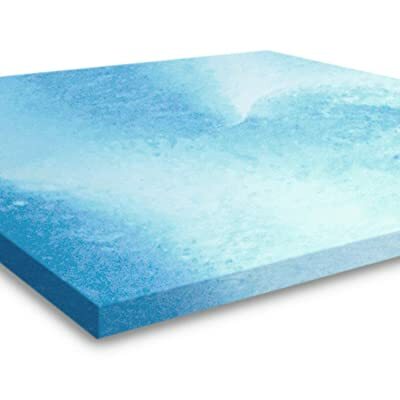 Latex toppers are growing in popularity, and becoming serious competition to memory foam ones, mostly because they have a faster response time and more bounce. You won’t get that sinking feeling that memory foam causes, either, which means you’ll sleep cooler, too. The bumpy surface of an egg crate topper might help minimize pressure points and provide some support, but the effect is only short-term. Once your body forms a permanent indentation, most of these benefits will be gone. Memory foam could be a better choice because it holds its shape better – and longer than egg crate toppers. Compared to memory foam, feather toppers are a better choice for those looking for a „natural“ way to add comfort to their mattress and keep it cool. However, memory foam retains its shape on its own, while feathers need constant fluffing. We’re so used to reaping the benefits of modern-day materials, such as memory foam, that we forget something that’s been around for thousands of years – cotton. Not only is it environmentally friendly, but it also means fewer chemicals will end up in your bedroom, too. Being thicker by a couple of inches gives wool toppers a significant advantage over memory foam. Plus, it won’t wear down as memory foam would, meaning you’ll enjoy the top-to-bottom support for years to come. Another factor you should consider before you buy the best mattress topper is the thickness. Now, keep in mind your options are somewhat limited here, since most toppers fall somewhere in the 2 to 8 inches range, with memory foam and latex ones offering more variety in that aspect. Here’s a piece of advice for side sleepers and folks that weigh more than average – always go for the thicker option. Next, you shouldn’t forget to check the size of the topper, and how “compatible“ it is with your mattress. Luckily, most topper manufacturers offer a wide range of sizes, giving you the option to choose, and minimizing the risk of buying an ill-fitting topper for your mattress. Sure, it may not seem like a big deal now, but wait until you wake up all hot and sweaty. Doesn’t sound great, huh? If you’re one of those „hot sleepers,“ you should pay attention to the topper’s heat retention. Generally speaking, it’s the memory foam ones that tend to retain the most heat. To help you out, I made sure to point out which models struggle with it in my mattress topper reviews. What’s the budget I’m working with here? While it’s mostly true that you get what you paid for, it’s also important to remember that a higher price doesn’t guarantee that a specific topper will be a good fit for you. So, set a budget you’re comfortable with and look for a topper that meets your needs within that price range. If you’re dealing with pain in a specific area in your body – or, even worse, in more than one area – you have to be even more picky about your choice of toppers. Disclaimer: When it comes to dealing with any pain – be it your back, hips, or shoulders – the right thing to do is consult your doctor. Despite my knowledge on the subject, I am not a medical professional, meaning you should never take my recommendations as expert medical advice. The main things you should be looking for in a topper are support and cushioning. Memory foam and latex seem to be the best choices of material, with firmness being the deciding factor. 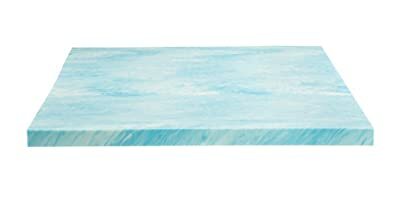 Medium-firm feel with at least three inches of thickness is the way to go here. If you’re suffering from lower back pain, the issue you have to address is the fact that your lumbar spine doesn’t stay adequately aligned throughout the night. High-density memory foam and latex toppers with a medium-firm feel could take care of that. When it comes to hip pain, the main things you should focus on are cushioning and even weight distribution. And while memory foam and latex do provide pressure point relief, you could also try pillow top designs, as well as alternative down. The main problems you need to address if you keep waking up with back and hip pain are pressure point relief and even body weight distribution. In that aspect, high-density memory foam and latex toppers seem to be the most beneficial. Side sleepers are more likely to experience these types of pain, especially when you factor in unsuitable mattresses. As stated previously, memory foam and latex toppers are excellent at addressing both hip, and shoulder pain, because the contouring they provide helps relieve pressure from all your major joints. That one’s a little tricky since you need to add some softness, but at the same time, you want to avoid compromising support in the process. If you already have a firm mattress, an excellent way to handle this is adding a sufficient amount of padding – address both lower back and shoulder pain, without affecting the support of your mattress. Have some unanswered questions about mattress toppers? What is the most comfortable mattress topper? No one can answer this question for you. With so many factors to consider, picking the most comfortable mattress topper isn’t an easy task, to begin with, but things get even more complicated when you factor in personal preference, too. If you want to know, comfort-wise, ExceptionalSheets Bamboo Mattress Pad with Fitted Skirt takes the cake. Does a mattress topper really help? So, what you want to know is, are they worth it? Well, yes, they are – as long as you know how to choose a mattress, and the best mattress topper to go with it (and I hope this buying guide will help out with that). In my opinion – and I’m sure many sleepers with back-related problems would agree with me on this – memory foam toppers are always the way to go. Paired with one of the best mattresses for back pain, they’ll surely provide relief. 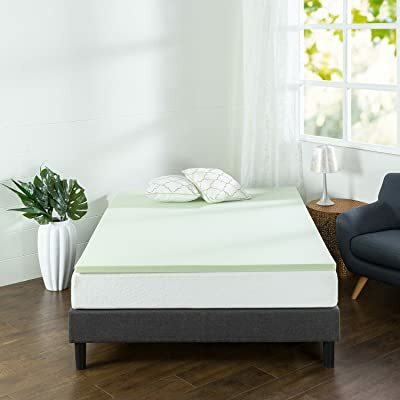 If you’re looking for a more detailed answer, though, I’d say the Best Price Mattress 4-Inch Memory Foam Mattress Topper qualifies as the best mattress topper for back pain. What is the best memory foam topper? That’s a tough one. Plus, the entire point of this article was to help you make that call yourself – with a little guidance from me, of course. 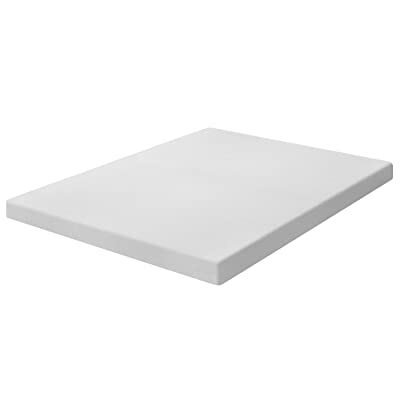 Anyway, when it comes to the best memory foam mattress topper, my vote goes to the Best Price Mattress 4-Inch Memory Foam Mattress Topper – stick around and see why! Will a mattress topper make my mattress softer? Well, there are two ways this could go down – either it will make your mattress softer, or it will make it slightly firmer. It all comes down to the type of mattress topper you have. On that note, here are some other tips on how to make a mattress softer. What’s the best way to clean a mattress topper? Generally speaking, though, you have several options – vacuuming, spot cleaning, the baking soda and vacuuming combo, and in some rare cases, machine washing is an option, too. All in all, if you know how to clean a mattress, you’ll know how to clean a topper, as well. How should I deal with the topper’s chemical smell? New mattress toppers are known for having a not-so-pleasant smell. The best way to deal with it is to let it air out – leave it outside (or near an open window) for a couple of hours. If that doesn’t cut it, try sprinkling some baking soda on it. Let it sit for a few hours, and then vacuum the topper. Can a mattress topper help combat night sweats? Mattress pads are generally a better choice if all you’re looking for is a cooling effect (more on that later), but there are indeed mattress toppers out there that provide the much-needed cooling effect during hot nights. How long do I have to wait for my topper to expand fully? That may vary from model to model, but a good rule of thumb is waiting at least 24 hours, to give the topper the chance to expand fully. Again, every manufacturer is different, so pay attention to what the instructions have to say about that. Can a mattress topper help make a bad mattress good again? A topper can do many things, but fixing a lousy mattress isn’t one of them. Lumps, bumps, tears, and sags can only take away from the topper’s overall efficiency. Do you need a topper, or a new mattress altogether? Okay, time to wrap things up. Since you made it to the end of the article, it’s safe to assume you’re perfectly capable of picking the best mattress topper by yourself. But, to give you that one final push, I’ll suggest a personal favorite of mine – the Best Price Mattress 4-Inch Memory Foam Mattress Topper. I’d like to hear your thoughts on the matter, though, so don’t be shy, and leave a comment below! This is excellent information I read several topics and all were easy clear and informative. Great work! I bought the Lucid mattress after I have read out your reviews. It’s creating a stylish and sophisticated look to my bedroom. Even my friends are getting attracted to this elegant mattress. I loved it. Your reviews make very helpful to choose the mattress. Thanks for it. Thank You, Very Useful Information. Sleep Cozee Mattress Protector Manufacturers in India. We Are Manufacturers Difference Colors and Varying Size. It Is 100% Water-Proof Bed Protectors, Best Quality and Dust Proof, Etc.